Ten years ago today my sister and and I arrived in Edinburgh. My first week was spent whinging about the £1 = $2.60 exchange rate*, drooling over men in kilts on Princes Street (sadly not a regular occurrence; just rugby fans), grumbling about the snoring dude in the youth hostel, searching for work and accommodation, swooning at the sun setting over the Castle, and generally believing I could control the shape of my two-year stay through meticulous planning and to do lists. I’d hoped to write some profound reflections on this unexpectedly long Scotland stay but looking back through my 2003 mega Book of Lists I found the long-running one below, where I noted new-to-me words. There are so many things I love about this country, but the juicy words it’s added to my vocab may be the most golden prize of all. Disclaimer for the pedantic: These words may not all be of Scottish origin, I just first heard them whilst living here. All the definitions in quotes are courtesy of the Scottish Vernacular Dictionary. dobber – “A tube, a bampot” which are also terms meaning “a useless individual”… are you sensing a theme? pish – it’s a verb and noun for urine/ation but it’s most useful as a descriptive term for something that is rubbish, boggin’, pants, terrible. I dunno how I survived so long without being able to say, “You are talking pure PISH”. fanny – lady parts but mostly usually “A stupid or clumsy person”. coupon – pronounced “coo’pn”. It’s your face. I most frequently hear it as, “You’ve got a bit of tomato ketchup on your coupon”. shoogle – to shake. Gareth says this when cooking dinner, “I’m just going to give the oven chips a shoogle”. skelf – a splinter. One of my favourites! I was confused the first time I heard Gareth say, “I’ve got a wee skelf and it’s driving me daft!”. jobby – a turd! I actually loathe this word. It is almost onomatopoeic and makes me want to run from the room. See also the loathsome phrase, “turtle’s heid”. baffies – slippers. It just sounds comfortable! skive – to slack off from work; or bludge as the Australian goes. “I skived off school today”. stooky – correct spelling: “stookie”. Plaster cast for a broken limb. Isn’t that a brilliant word? Sign mah stookie! windaes – windows. There was a local band that had a song called “Yer Windaes Are Panned” which is just bloody brilliant. boak – to vomit. “The thought of breakfast with this hangover is giving me the boak”. Endlessly useful word. spuggie – a sparrow! another all-time favourite. Such an energetic wee word for an energetic wee bird. I wish I’d kept this list going over the years, there’d be SO many more since then! * today the exchange rate is £1 = $1.45 AUD. Reverse pain. What about bonnie which means pretty BUT in parts of the North West of England it means ‘fat’ or is that one and the same thing! I am pleased to say that I have heard MOST of these words, though I’ve noticed they tend to be regional. Around our house you hear “oaksters” (underarms), “minging” (stinky, dirty), and many more I can’t recall now. Difficulty here is that my kids are going to go to school and tell the teacher they have a “skelf” and no one will have any clue what they are talking about. I don’t like the word “jobby” either or “spunkbag,” which seems to be used affectionately (as in “ya old spunkbag”) but sounds disgusting to me. Interesting …. there a very similar words in Northern Germany, “pieschen” [: pee’shen] for peeing, and “schuckeln” [:shoo’keln] for e.g. rocking a cradle, etc. “stooky” => Stuck [i.e. stucco, but pronounced shtoo’kk] = plaster. Makes me want to go to the airport and go to where the men in kilts live. Mingin’ (disgusting) and Barry (awesome) were my first couple of memorable ones (that I hadn’t already been exposed to through my Scottish parents here in Aus). I am yet to find an Australian/English equivalent term that fully encapsulates the meaning of scunnered. Any suggestions now that you are (technically) bi-lingual?!? As a kid I got so much crap here in Australia for saying that something that wasn’t straight was ‘squint’. I was most relieved to find out it was a Scottish term and that I wasn’t just hijacking random words and misusing them. One visit to see the relies when we were kids, my granny said to my sister “give the cat a wee clap”. My sister gave her a bit of a strange look and then walked over to the cat and clapped her hands together. 20 years later and they all still bring it up each time we are back for a visit – they still think it’s hilarious. hehehe! i think you’re right, there is no substitute for scunnered. too good! Jobby was the only one I knew and I got the meaning wrong! Happy 10 year anniversary! I’m so going to start one. I was 6 years in december… and that feels like ages! Happy anniversary! This means I have been reading you for about 9 years, yikes. As I grew up in Northern Ireland and went to university in Scotland many of these words are familiar to me. A lot of the dialect words are the same and also some of them have their origins in Irish/Scottish Gaelic. One my favourite Scottish words (not used in Northern Ireland) is peelywally which describes someone who looks particularly washed out or pale. I still use it even though no-one in London has a clue what I’m talking about. I have to say that Scottish is my most favorite accent/language…oh to listen to a Scottish man. Swooooon! Happy anniversary! Most of that isn’t new to me…I think I must have listened to way too much Billy Connolly when I was younger… Scottish humour always cracks me up. It’s so much funnier with that accent and the local slang. Argh! My great grandparents were Scottish and two generations later my mum still says “jobby”. Of all the repulsive things to survive! Don’t forget PHWOAR! Or is that Aussie? Can’t believe it’s been 10 years now – time does fly! My favorite from your list is clarty, perhaps because I’m always dropping something on my clothes, too! wow 10 years – you arrived not long after we left! must seem like a lifetime! love the words – I am very fond of numpty. E likes to talk about “backgreen belters” (think Shirley Bassey’s style of singing) which always amuses me. But one of the most astonishing expressions of his is “back of..” as in I will meet you back of 5 ie any time after 5!!!!! As a word nerd, this post AND all the comments are just heavenly! And yesterday while planting peas (not a euphemism) I was listening to a British Library podcast (no, that’s not nerdy…) and the specific episode was on dialects, and the 1st they talked about was Geordie (woah-this whole time I thought it was Jordy). Episode title: Cuddywifters, cack-handers and coochies. =) Can you see why I downloaded that one? Burst out laughing when I read the “J” word. Even though we’re Canadian, that was my mother’s term for a BM when I was little. Oops! Is BM universal or just American? I love your Scottish language finds — maybe that “Aussie lass in Scotland” angle could be your next book? I love collecting words. I’d always try to learn some regional dialect when I was in Japan, but it was usually when I’d had a few so never remembered the next day! Atm I’m working with a Welsh guy and we had to explain the word ‘doozy’ (I’m not even sure if I spelt that right) – it’s really hard to explain! Also, 5 years for me! Wow! I can’t believe it’s 10 years. I’ve been reading your website since before you moved to Scotland. 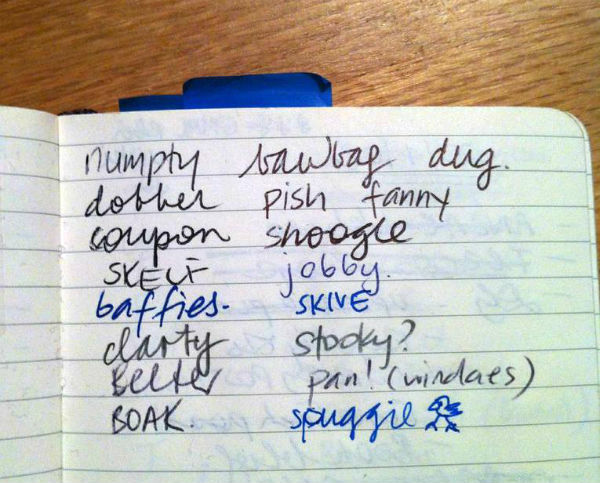 Of course, being Scottish, I saw this list and immediately started giggling like a 12-year-old boy. I hate the word “jobby”, too. BOAK. Ugh, we used it all the time when we were younger. “Mam, I need a jobby but I cannae get it oot!” or something to that effect. Not used so much now, thank god. I don’t think kids use it much now; they actually use the word sh*t, and then get skelped around the heid. That’s a very funny list of words. It reminds me of watching episodes of Rab C Nesbitt on the BBC in the early 90s with the subtitles on. Hilarious. I hope you’ve done your bit to acquaint the Scots with the Australian vernacular. And ouch! those exchange rates hurt!